Members of the Vermont chapter of Native Fish Coalition have initiated a project to take a look at Vermont’s highest-in-the-east daily limit on brook trout on rivers and streams, and highest-in-the-Northeast-and-Mid-Atlantic daily limit on brook trout in lakes and ponds. Vermont NFC is looking to build a coalition of organizations, businesses and agencies who feel as we do that this is something that needs to be looked at. The brook trout, Salvelinus fontinalis, is the official state cold-water fish of Vermont. It was so designated in 1978. Vermont NFC has collected the data, created a detail presentation, and has started reaching out to potential partners. The plan is to build a coalition and meet with Vermont Fish and Wildlife to discuss the matter. The goal is to try to provide increased protection to the states wild native brook trout. At 12-fish, Vermont has the highest daily limit on brook trout in rivers and streams in the East Coast. Vermont's daily limit is not only the highest, it is more than twice as high as seven out of eight of states, and 1/3 higher than the next highest. When compared to the average daily limit on brook trout in rivers and streams, sans VT, at each geographic level looked at, Vermont is more than twice as high. Vermont's daily limit on brook trout in lakes in ponds is half what it is on rivers and streams. At 6-fish, Vermont’s daily limit on brook trout in lakes and ponds is slightly higher than the average in Northern New England, New England, the Northeast, the Northeast and Mid-Atlantic, and the East Coast. It is important to note that VT NFC is not challenging the aggregate daily limit on brown, rainbow and brook trout, or the daily limit on brown or rainbow trout, just the daily limit on brook trout. Vermont is providing a higher level of protection to nonnative brown trout and rainbow trout than it is native brook trout. 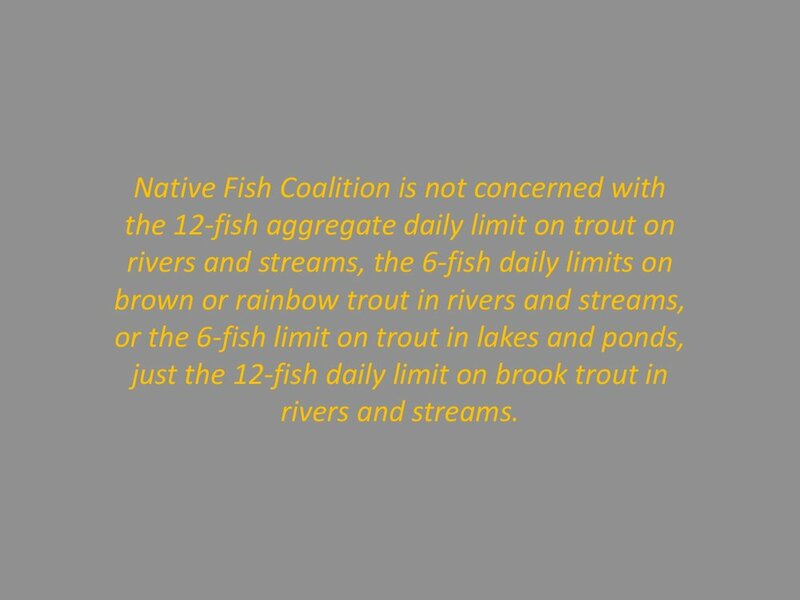 Specifically, while the daily limit on trout in rivers and streams is 12-fish, only 6 can be brown trout and/or rainbow trout, yet all 12 can be brook trout. Providing native brook trout with at least as much protection as nonnative brown trout and rainbow trout, which are often stocked, would provide a higher level of protection for wild native fish. Adjusting Vermont's daily bag limits on brook trout to reflect the average in Northern New England, New England, the Northeast, the Northeast and Mid-Atlantic, or the East Coast would have conservation, economic, social and marketing value. It is our hope that others will see this in the same light we do, and be willing to join us as part of coalition that looks into the issue and decides what if anything should and can be done. To read more click here.